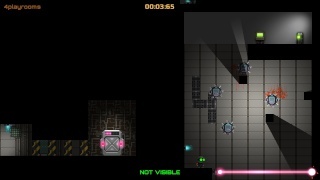 Stealth Inc. 2 is a 2D action/platformer developed and published by Curve Studios the masterminds behind the development of Lone Survivor and the upcoming Wii U eshop title The Swapper! But does this game live up to the high standards that Lone Survivor has set? Continue reading this review to find out! In the main campaign mode of Stealth Inc. 2. you must circumnavigate dangerous platforming stages by quickly avoiding traps and relying on your clones to unlock areas that you couldn't normally reach without dying! These stages are found on a large hub world and though they aren't terribly long they're incredibly difficult at times. This adds to the enjoyment of the Leaderboard feature which can be viewed at the entrance of each stage so you can see just how good you are compared to other Stealth Inc. 2 players around the world! There are several tools to find in the hub world that will add additional functionality to your character which will help you during your missions! 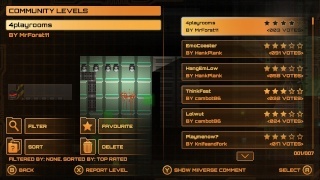 Stealth Inc. 2 also possesses a rich fully featured level editor and allows players to share their creations and play other player's custom stages as well as rating the levels! The feature is great and all, but there isn't that much content at present and what's there is mostly nearly impossible stages which detracts from this feature, though perhaps in the future there could be a decent amount of quality user created stages from skilled level designers! The game also features a test chamber mode which is essentially a quick play mode to jump right into the campaign stages that you've already beaten and is a good mode for players that are aiming to reach the top of the leaderboard for specific stages! The Controls in the game are quite intuitive and easy to learn and the game's local co-op can be good fun! The Gamepad displays the area map as well as other information in the game and is fairly useful and the Off-TV Play is flawless and really adds to the game! 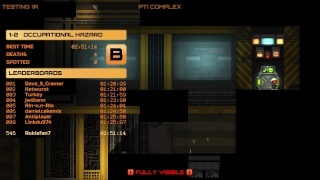 Stealth Inc. 2 looks gorgeous for an indie title as the lighting and particle effects are extremely impressive and the characters and objects look very detailed! The stage backgrounds are equally impressive despite the darkness that is prevalent in the game's many stages as blood stains, unique machines, and other impressive details can be found when you light up an area! The cut-scenes in the main campaign mode also look quite good and really add to the game's overall presentation! The music is also superb and fits the game quite well, however there isn't much variety to the soundtrack though the handful of music tracks that are there are top-notch! The sound effects are just as good and are decidedly retro sounding which will give a feeling of nostalgia to players who played games during the 90's! Overall the game's audio-visual presentation is terrific and won't disappoint! 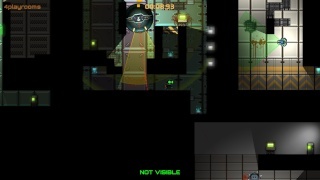 With nearly flawless gameplay, a huge amount of stages and content, a rich level editor and level sharing features, intuitive easy to learn controls, and superb graphics and music Stealth Inc. 2 is an amazing title that every Wii U owner should download, however the somewhat limited number of different music tracks does prevent this game from receiving a perfect score. Nonetheless we highly recommend this title! Whoa your review of this game is more detailed than usual! Sweet review dude. I'm gonna download this as soon as I get home later today!